A new way to booze: Makers brew up virtual-reality experiences that transport you to the hallowed birthplaces of their drinks' distinctive flavours. "From man's sweat and God's love, beer came into the world." Saint Arnold of Metz said that, back in the sixth or seventh century, just before doing a knee-slide across the dance floor and falling asleep in a hedge. Beer hasn't changed much since old St. Arnie's time, but that doesn't mean he wouldn't appreciate new and interesting ways of enjoying libations of any stripe. And since he once used booze to stop a plague, he clearly had his head on straight. 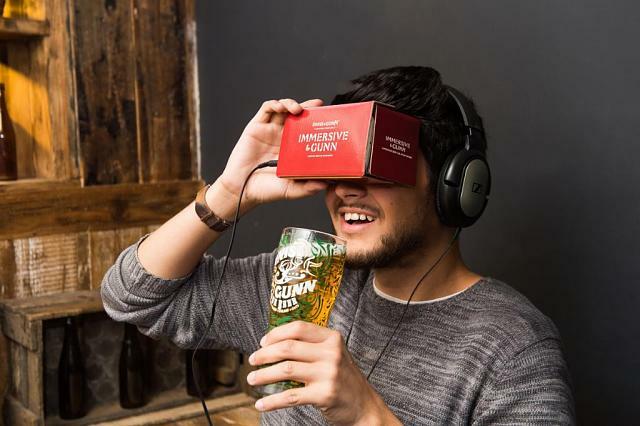 For a new slant on enjoying the age-old pastime that is boozing, Scottish craft-beer brewer Innis and Gunn and rumrunner Havana Club have brewed up virtual-reality experiences that take you to the hallowed birthplaces of their unique flavours. VR fools the eyes and ears to take you somewhere strange, and the goal of these experiences is to fool your tongue too. By taking you to where these drinks come from, the makers claim you taste them differently. Being the intrepid investigative journalist I am, I rigorously tested these taste-related claims by going to some bars and drinking a lot. Heck, it worked for Hemingway. First off, I tried the Innis and Gunn experience at a pub in North London, all dark wood and brass pipes and postwork loosened ties. Founded in 2003, the Edinburgh-based brewery is known for its Innis and Gunn Original beer, blessed with a lovely toffee flavour that was the accidental result of aging the beer in whiskey casks. With a glass of toffee-toned tipple in hand, I strapped on a Samsung Gear VR headset with noise-canceling headphones to block out the burble of reckless Thursday evening drinking. The next moment, I'm standing in a cave. Then I slowly fade from one bucolic Scottish countryside to another. In a forest a tree cracks and falls. A wheat field whispers. Waves lap at glistening rocks. Night falls over a shimmering loch. As I take a long draft of malty goodness amid this highland tranquility, let's turn to cognitive neuroscientist Jacob Jolij, who helped craft the VR experience, for the science-y bits. "The dense forestry connects the brain with the oak-aged tones within the beer," Dr. Jacob explains, "before transitioning to a sunset which shifts the focus to its sweetness, creating a dynamic, multisensory experience." OK, Doc, with you so far. "Combined with the openness of the cliff-top and lapping waters, this forces the mind to focus on the smoothness of the pint and make the drink appear all the more softer." Hmm, if you say so, Dr. Jacob. "In this film, the drinker also watches time move beneath their feet, which harks back to the maturation process that makes this beer so distinct in its taste." Sorry, you lost me there, Dr. J. But this VR stuff is certainly more than a booze-soaked fancy dreamed up half an hour before last call. Virtual reality has an astonishing ability to influence our senses and emotions: for example, soldiers suffering from severe burns report their pain lessens when they play a virtual-reality game set in a snowy landscape. It's all down to the magic of presence, the feeling we are literally in another place. It's presence that gives us the spike in adrenaline when we are shown an entirely fictional environment and asked to take, say, a single step into a yawning virtual abyss, even though we know full well it isn't real and we're actually standing on a perfectly un-abyss-like carpet in a room where the only danger is looking like a berk in a plastic helmet. Your phone goes in a Google Cardboard and the beer goes in a glass. The two Immersive and Gunn experiences are only a minute long, but I could happily have stood and listened to the soothing sigh of the wheat field for much longer as my heartbeat slowed and the flavour of the beer expanded in my mouth. Sadly, journalism called. So a couple of days later I followed the beer VR experience with a rum-flavoured version. What's the old saying? Beer then rum, feel...fun? Probably. The Havana Club experience also takes you to the birthplace of the drink. This time round, the VR experience was part of an installation in the back room of a pop-up rum cantina in London's booze-soaked Soho. The room was designed to feel like part of a Havana bar, filled with trinkets from Cuba. Cleverly, when you don the headset, the VR experience starts in an identical room filled with the same trinkets. So one minute I was looking at a real wooden globe in a real bar in London, and the next I was looking at the same globe as it started to lazily spin and I was now in a bar in sun-dappled Havana. 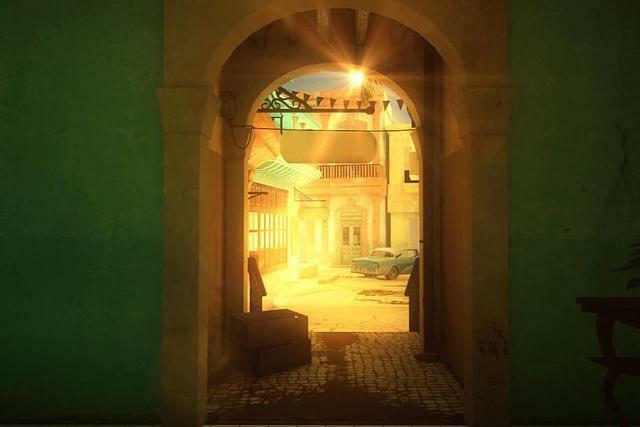 In this virtual bar, the rich voice of a Cuban gent suavely describes his life story. As the view shifts to a Cuban home, salsa dancers gyrate on a tiny black-and-white TV and a stove sizzles in the kitchen just out of view. It's all very romantic, a hazy, tourist version of nonspecific Cuban history, as long as you don't think about it too hard. Finally, as the oak-smoked voice directs my attention to the window once again, I slip off the headset and there, back in the room, a very real and very tall Havana Club cocktail is waiting. Don't mind if I do, seor. The Havana Club VR experience appears in pop-up bar and restaurant Casa Havana in London until Saturday 20 August. 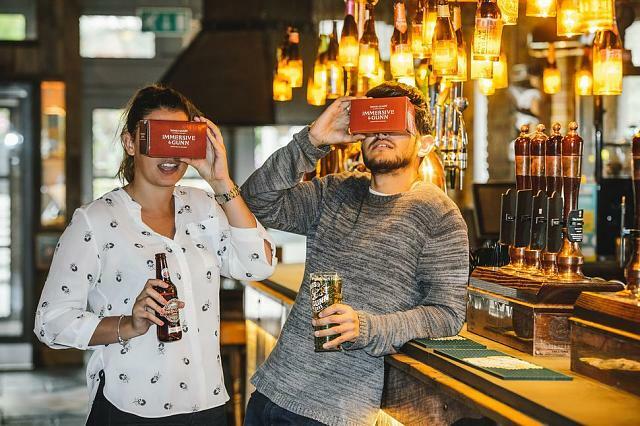 You can try the Innis and Gunn experience in person on a VR headset in coming weeks at bars in London and Glasgow. Alternatively, get a taste on your smartphone with a Google Cardboard visor by visiting the Innis and Gunn channel on YouTube. Load up the video, hit the Google Cardboard icon and drop your phone into the Cardboard visor to enjoy it. If you don't have a VR headset, you can still scroll around those YouTube 360-degree videos on your phone or computer. I don't know if my senses were manipulated into tasting either Innis and Gunn or Havana Club differently -- I'm British, my palette is calibrated for quantity rather than quality. But as the bustle of the pub fell away, both VR experiences connected me with the drink in my hand and the place it came from in a way I haven't felt before. F. Scott Fitzgerald described alcohol as "the rose-colored glasses of life", and in this case looking through rose-colored VR lenses served up a refreshing reminder that drinking is a pleasure in itself, that a drink can be savoured and enjoyed as a memory of places you've never been and a reminder of people you've never met. A drink can be a way of exploring the world without having to remember where you put your passport. Or as Innis and Gunn master brewer Dougal Gunn Sharp puts it -- describing both the virtual-reality experience and his own flavourful beer -- "It's not a pint of the usual." Please remember to drink responsibly. If you drink, don't drive. As Dean Martin reminds us, don't even putt. Saw this video on YouTube the other day. It is extremely clever as a ad campaign! I saw it by coincidence, but it's a start of what is about to come, I hope soon having a lot of places with VR options for their publicity and experiences. VR cover for conferences - any suggestions?